Why do employees steal? It's simple. Now can you stop it? The good news? You can prevent these “irresistible opportunities” at your restaurants – if you have the right systems in place and if you know what to look for. 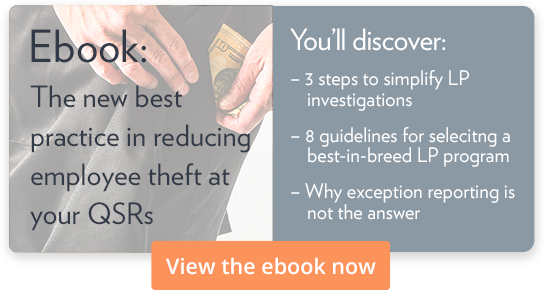 Read the suggestions below for simple solutions to combat employee theft. One of the easiest ways to steal is through the point of sale system. To protect your cash (and your cashiers), follow your brand’s cash policies. Typically, one cashier is allowed per drawer, and the cashier must count their drawer at the beginning and end of the shift. Schedule enough cashiers and include overlap to allow for the proper settling of cashier shifts. Enough cashiers on the schedule, around 6 to 8 in a QSR environment with extended hours. 5 to 10 minutes of overlap for cashiers to allow for proper settlement. A manager-in-charge scheduled to run a register during peak times. It’s difficult to control the shift from a register, and it typically invites other employees to work the drawer. Every manager-in-charge must know in advance that their schedules are set up for success for the week. They need to be in a position to control the shift, monitor cashier performance, and enforce the brand cashier policies and procedures. They are the eyes and ears of the operation and ensure policies and best practices are being followed. The entire store leadership team must be aligned on your brand-specific metric thresholds for voids, deletes, refunds, and cash over/short. That way, you are all on the same page and can identify suspicious trends easier. Also, cashier performance should be reviewed at the time of settlement and coaching or immediate corrective action must be taken for variances exceeding the thresholds. If you have a web-based solution like Delaget Guard, use it daily to monitor your cashier and manager performance. The entire management team should keep each other accountable. For example, conduct safe audits with every manager shift change, follow up on all cashier-level reports (including meal and discount slips and refund documentation), and review daily paperwork to make sure the actual deposit matches the expected deposit. Policy violations almost always lead to theft and loss. Encourage your management team to coach the employee’s behavior before there is loss. By following these steps, you’ll make it harder for your employees to steal, thereby discouraging the “irresistible opportunities” in your restaurants.